When my sister first moved to Central Otago to begin her summer working on Felton Road vineyard she had no idea what to expect, and neither did we. We were not familiar with the environment: we did not know the roads she would be driving, or the house she would be living in, or the spectacular scenery she would be surrounded by at the vineyard. From Wellington we could only remind her to wear sunscreen and make sure she was eating something other than toast. 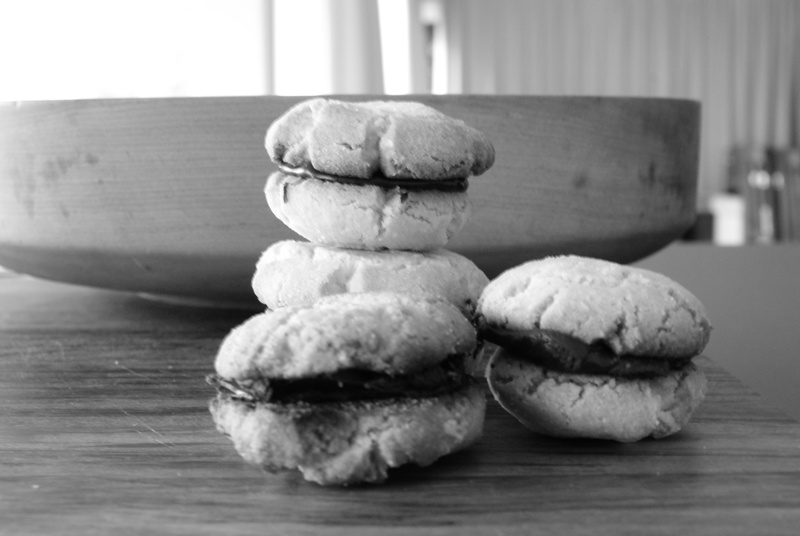 Georgie made these biscuits during her first few weeks of work to take to the vineyard and share with the other workers. I thought it was a good sign she was baking for other people rather than to comfort herself in moments of anxious self doubt and homesickness with half a dozen biscuits. Last week Georgie was home and my family spent the week cooking and eating and drinking together. It was a good week. Georgie and I made Baci di dama on Monday evening while Mum cooked a piece of aged sirloin (aged sirloin on a Monday night!!). We drank bubbles, ate cheese and Dad conducted a little wine tasting. These biscuits are very easy to make and I imagine they would be more so without all the distractions of wine tasting and bubbly drinking and cheese eating. Baci di dama means lady kisses in Italian. Eating these biscuits, though, I would liken them more to a tenderly spiky kiss from a softly bearded gentlemen. They are not the sort of satin pillow softness of, say, a mother’s kiss, but they do have a delicate crumb and crunch to them. Ground almond adds a more interesting note than a normal yo-yo biscuit, the sort made with mostly butter and icing sugar. When you make these biscuits, wherever you are in the world, whoever you are with, bearded gentlemen or little ladies, know that they will be enjoyed by all. 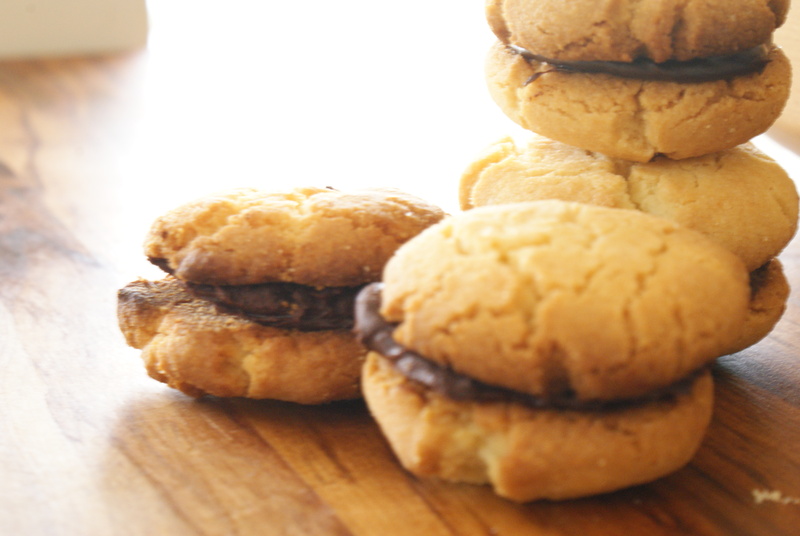 These biscuits can be sandwiched together with chocolate or Nutella. I think an almond butter cream could be nice also. Stir in the flour and ground almonds until a stiff dough. (Initially the mixture might look like bread crumbs, just keep working it quickly until smooth). Form walnut sized balls and place in the oven for 12-15 minutes or until golden. Melt the chocolate and butter in a heat proof bowl over simmering water. Allow to cool and thicken. Once biscuits and chocolate have cooled, sandwich biscuits together with chocolate mix, or filling of your choice. Thank you for the photos and recipe Georgie, x. Chocolate flavoured whipped cream doesn’t sound too bad, does it? But what if I say that this chocolate whipped cream is frozen and somehow meant to be ice cream. The process of making this imposter ice cream is quite lovely. It feels like you are doing something good, something exciting. With the heart-stopping quantities of cream required it surely is going to be the most lush of desserts, you think to yourself. Firstly, you whip the cream until quite thick – “slovenly folds” as Nigel Slater wrote. Then mix through some icing sugar and a drop or two of vanilla essence. You place the cream in a shallow container in the freezer for 30 minutes or until a sort of thin, icy crust begins to form at the edges. Meanwhile, melt chunks of chocolate with a slosh more cream in a bain-marie. Once glistening and luxuriously smooth, let cool. 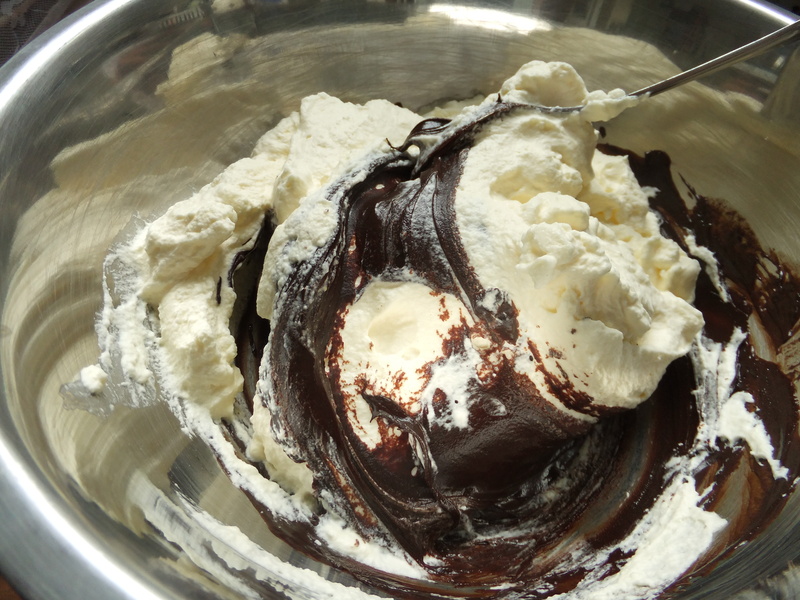 Remove the cream from the freezer and place in a bowl, add the chocolate. Begin to fold through; rich dark streaks swirling through the white. Until they swirl no more. The cold cream has in fact hardened the chocolate into grainy, pebbley bits. You must smash through the mix with a fork. Return the chocolate cream to the freezer for a few hours. At this point I had a few doubts. Eating the frozen chocolate cream is what I imagine eating cold sand could be like. Your spoon seems to ricochet off the many minuscule ice shards. It does not delicately curl the contours of your spoon, nor does it tenderly roll through the contours of your mouth. The fine grains of hard chocolate and the tangy taste of cream and the bitterness of dark chocolate jar and clash. It is not the sort of cream to hold on your tongue and allow the flavours to introduce themselves, like the freshness of raspberry or lemon ice cream, or the pleasing familarity of vanilla or strawberry. Instead, you are left with the kind of discomfort that comes from too much chocolate and cream, a head or a stomach discomfort I can never be sure, but either way, you need a lie down. I had grand ideas for this post. I was going to write about the day I bought this little book for €5 from a stationary shop in Annecy, France. I was going to begin with a description of the weather – a clear and crisp day in late January, how we were wrapped up in hats, scarves, gloves and coats. I would have told you that my friend Ivan and I spent the day walking around the lake ripping off pieces of baguette and eating ham and Swiss gruyère from their paper wrappings. And that we had crêpes for afternoon tea with caramelised bananas, chocolate ice cream and chocolate sauce. Afterwards we walked into the stationary shop and I probably picked up and put back down this petit livre several times. It is called Desserts with the sub title, trop bons. It all looks trop bons too; almond and pear tart, apple and red fruit torte, pears stuffed with figs and then wrapped in pastry, a red rice and sauteed grape risotto, apricot soufflé, tiramisu made with white chocolate and raspberries, peaches poached in Marsala, honey and banana ice cream and yoghurt and pistachio semifreddo. I could make it all. 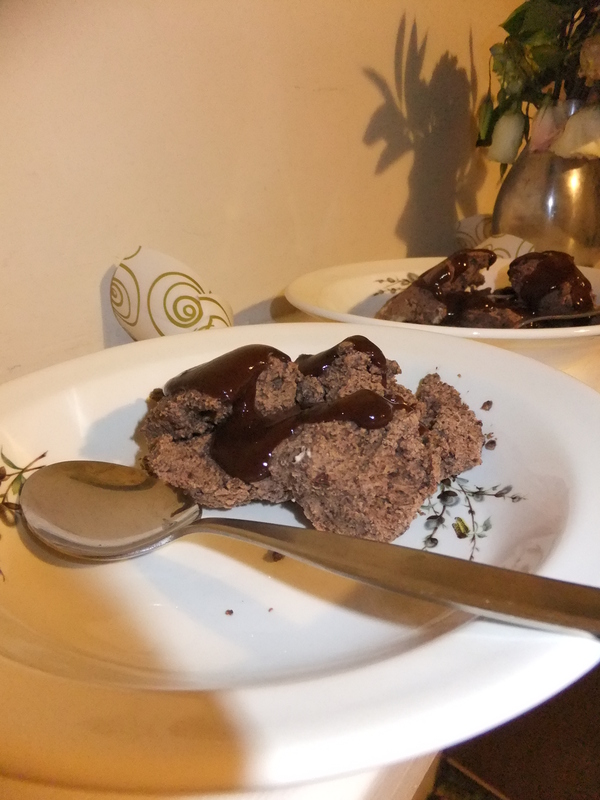 And yet, of all the desserts, page 172 was selected: glace au chocolat. 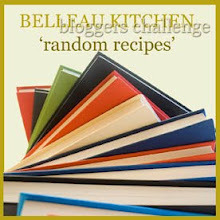 This post is my entry into the One Year Anniversary of Belleau Kitchen’s Random Recipe Challenge, even though the recipe, or my execution of it, needs some serious work. I am wondering if mixing through the chocolate before freezing would have produced better results. Beat the cream and the milk until thick- not so much that peaks form but just softly whipped. Incorporate the icing sugar and the vanilla extract. Pour the mixture into a shallow container and place for 30 minutes in the freezer, until the ice begins to take the outer edges. 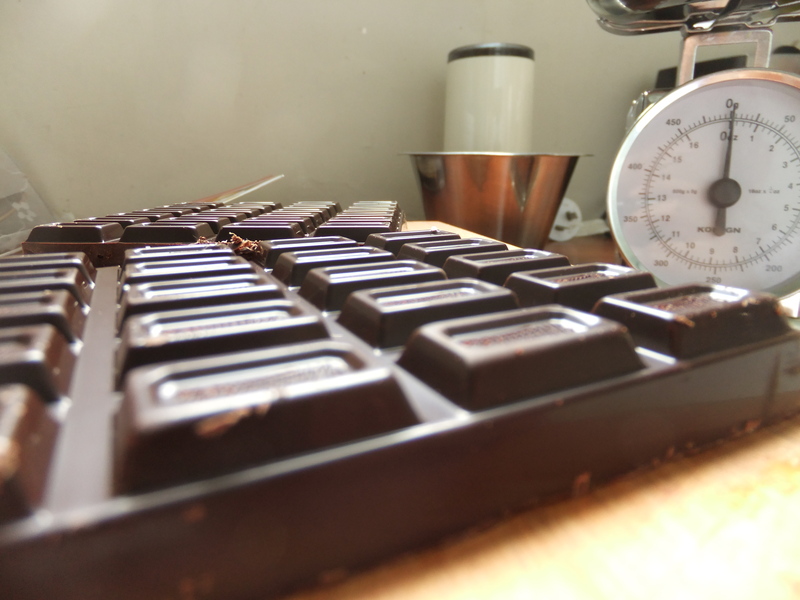 Melt the chocolate in a bain-marie with the second measure of cream. Heat until the mixture is combined then let cool. Remove the ice cream from the freezer and pour the cream into a bowl. Incorporate the chocolate and work énergiquement with a fork. Pour the chocolate cream back into the plastic container, cover and place back in the freezer. Remove the ice cream from the freezer 30 minutes before serving. At the house where I grew up, behind our makeshift compost bins, was the most abundant rhubarb patch. Long, bright red stalks with forest green leaves flourished in the warm and rich soils of breaking down vegetable matter. A sink full of chopped rhubarb and water was a common sight on a Sunday night. 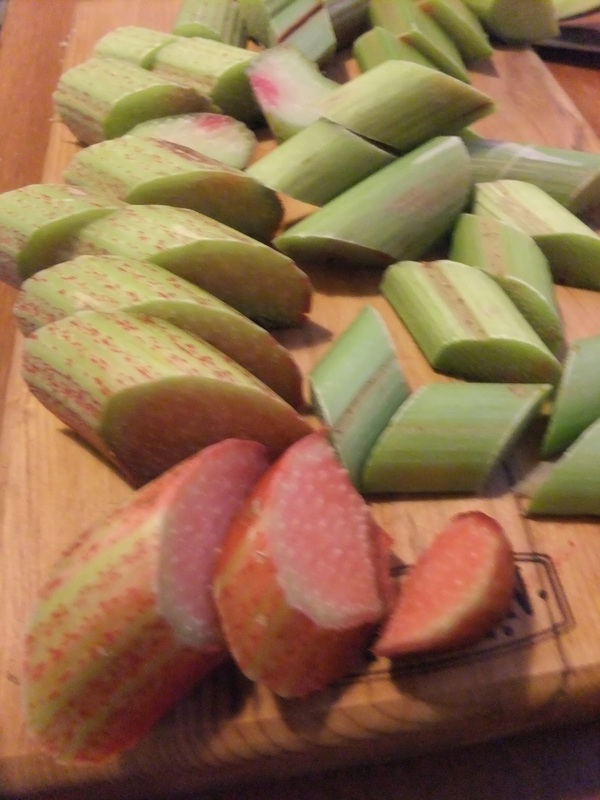 While Mum prepared dinner, strips of ruby red bobbed about in the water, ready to be made into rhubarb crumble for dessert, or stewed rhubarb for our breakfasts, or a spiced rhubarb cake for our lunches. The rhubarb my parents grow in their current garden is doing well. A single leaf is about the same size as a folded out newspaper and they often break under their immense weight. Most of the stalk is a pale green with small flecks of red. They smell sappy and perhaps of a crisp Sauvignon Blanc. I took three stalks and they sat on my kitchen table for a day or so before I thought what to do with them. A rhubarb and ginger compote; tart and sweet all at once, and then, a soothing heat resonates around your mouth. This compote took less than ten minutes to make and brightened little bits and pieces all week – with lemon cupcakes, as a topping on thick Greek yoghurt, on crusty sourdough bread like a sloppy sort of jam and atop my morning porridge. Rhubarb is one thing I can never bring myself to buy; it is a vegetable to grow. Next time I will double the quantities, three stalks doesn’t make enough to eat out of the jar with a spoon. Place all ingredients in a medium saucepan and bring to a gentle simmer, stirring occasionally, until rhubarb is tender and compote begins to combine, about 10 minutes. Transfer to a bowl and leave to cool. 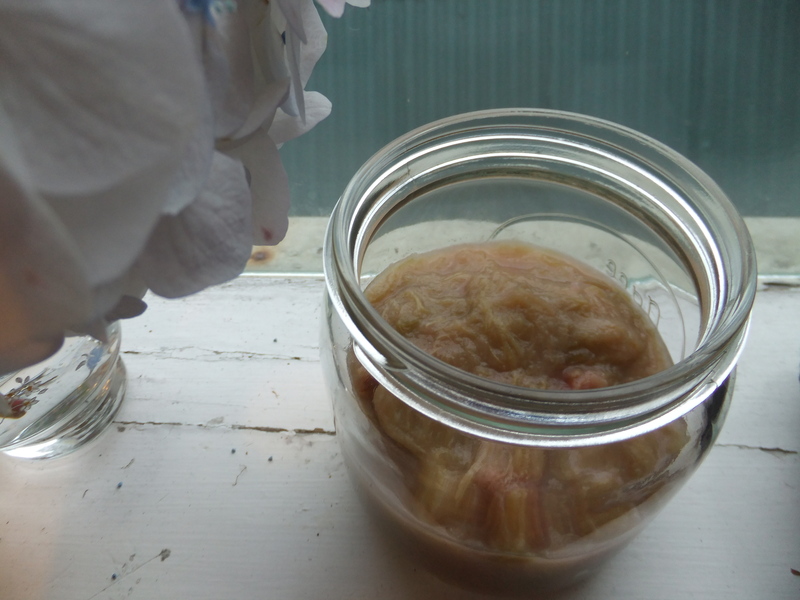 The colour of the compote will vary depending on the colour of the rhubarb.